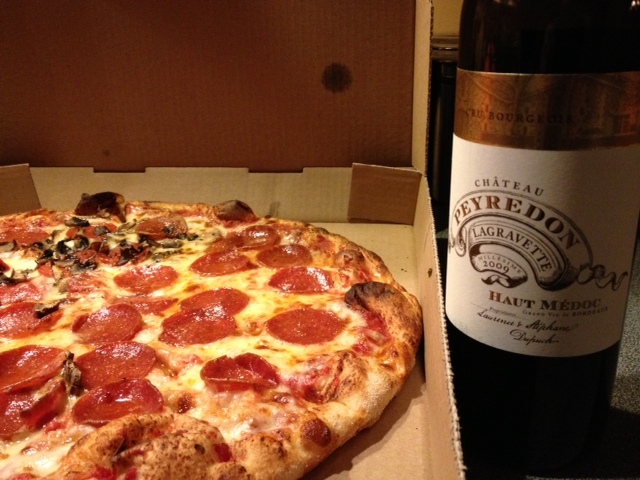 Friday night I pulled the cork holding back the treat that is the Chateau Peyredon Lagravette Bordeaux. Nice! This full, rich red accompanied only a local pizza (half pepperoni and half pepperoni and mushroom) but really represented itself well. My wife, who hasn’t sniffed a red that she’s enjoyed in some time, was encouraged upon her first noseful and sampled with an approving nod. Chateau Peyredon Lagravette 2009, Haut Medoc, Grand Vin de Bordeaux, France. My simple palate detected spicy undertones in this fruity red, possibly the “grippy” vibe recognized by the experts as outlined below. Earthy, too. The Chateau Peyredon Lagravette is a 63% cabernet sauvignon and 37% merlot blend (made of grapes harvested on the 8th and 13th of October), and I think I enjoyed this more than other bordeaux blends that bring more syrah or the like to the table. I polished off the second half of this Cru tonight while watching the NFL Championship games between the Falcons/Nincrs and the Patriots/Ravens–a worthy beverage. This was a pickup from our local Bottle King and I should grab several others just like this while the success is fresh in my mind!